Schoolboy Q and Carnage co-headlined the annual Homecoming Dance Party and brought exciting elements to the show Jan. 25 in the Armory. This year’s concert featured hip-hop groups and rappers, including a Drexel sophomore whose stage name is Mason IV Real , Ground Up, Trinidad Jame$ and Schoolboy Q. The lineup also included saxophone player Griz and DJ Carnage. Both artists incorporated pop songs, jazz songs and classic rock songs into their electronic dance music. Griz pulled out a saxophone in the middle of his set and started playing live jazz over prerecorded songs. The lineup was created with a diverse audience in mind and included a mix of genres from past concerts. Carnage’s performance featured two giant inflatable lookalikes set on both sides of the stage. These inflatable likenesses will be used in only two other performances besides the Homecoming Dance Party: Coachella Music and Arts Festival in Indio, Calif., and Ultra Music Festival in Miami. The replicas sported a Chipotle gang shirt and a Carnage jersey. Smoke came out of their ears and laser lights shot from their eyes, creating a light show on the Armory’s back wall. However, the inflatable men were not the only big effects used in this year’s show. Junior entertainment and arts management student Brett Axler, who has worked this concert for the past two years, explained that this year’s lighting and sound was more professional than that of any other year. Axler said that the Armory was outfitted with a similar lighting rig as this summer’s Made In America concert on the Parkway and that the sound system was comparable to what would be found in the Mann Music Center. 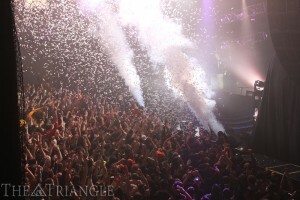 The show also included streamers and confetti that burst out during both Griz’s and Carnage’s sets. 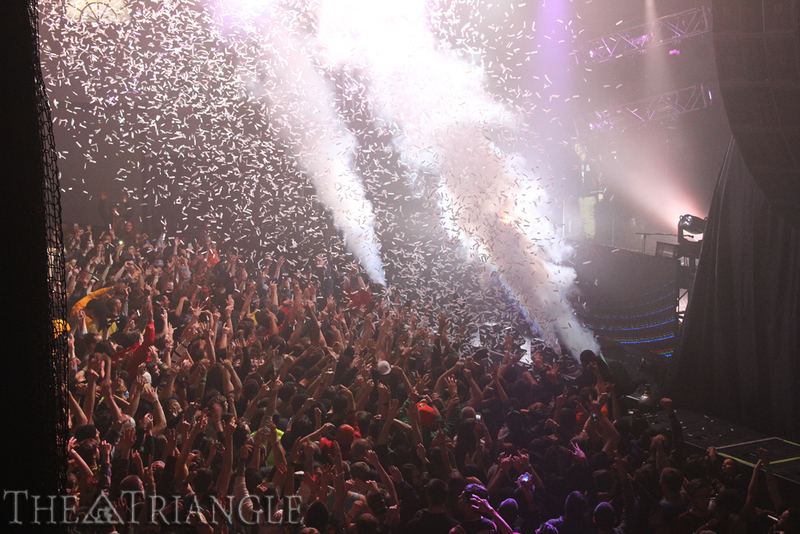 There were also yellow, white and blue balloons that fell from the balcony during Carnage’s performance. For the first time in the concert’s history, VIP tickets were available for purchase. Those tickets gave access to balcony seating, a separate entrance, catered Subway sandwiches and waters and sodas. “The free food and drink was nice, the extra entrance was nice. The view was great too. If you were just looking to watch the concert, it was great. The only beef I had with the VIP section is that people were very uptight,” Stephen Reading, freshman economics student, said. This show, with its improved sound and light, had a large target audience, including students from other colleges. Tickets this year were sold to students from 37 different states. “Everybody [was] basically open to bring two guests as well, which we thoroughly enjoy[ed], to bridge the gap between our University [and others],” Hamalian said. However, no concert is completely flawless. A few students had to be escorted out during the concert, mostly for rowdy behavior and partaking in crowd surfing. One student was escorted out by medical personnel because of possible alcohol poisoning. A consistent problem was concert goers pushing up against the barricades. However, Axler, who was also in charge of security, said that security was tighter than ever this year, so these problems were efficiently dealt with. Another concern was the weather. There was light snowfall throughout the entire day, which made it the most snow that the concert had ever seen. Hamalian said he was worried people would not brave the cold to make it to the concert, but this year broke the attendance for a homecoming concert. The concert was a combined effort of many people, including Hamalian, Axler and junior entrepreneurship major Ben Melman. The concert was hosted by Drexel Traditions and the Dragon Concert Series. It was sponsored by SAFAC, Student Affairs and the LeBow College of Business.